I knew when I saw this gas mask at a local antique mall that I was looking at something special, and HAD to have it. 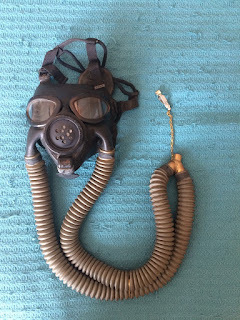 It was labeled as a Korean War Fighter Pilot Oxygen Mask, and I got it for a steal at $80! It took me a while to determine what exactly I was looking at. The attached tag was a big head start referencing the Diaphragm Mark III and IV, along with the giant USN stamped on the forehead.